The young grey she-cat slowly walked out of the apprentice's den to stretch. She'd been up very late the night before stargazing. Of course, the only reason she was stargazing was because she didn't want to the see her constant nightmares. After a long sleep, she was ready to function again. Apparently the rest of the camp had that same thought about an hour before she did. All the patrols were out and warriors were adding onto the pile of fresh prey in the middle of the camp. She wasn't completely sure what to do so she told the deputy she would go out to work on her hunting technique and then actually hunt. She left quickly, eager to escape the loudness of the camp as well as anxious to work on hunting, which was long overdue for her. She remembered how her old mentor had died. She would probably never go to the Thunderpath again. He had been showing her all the borders about a week before, so that when she later went hunting for the clan on her own she wouldn't cross the border and start a fight. They arrived at the old Thunderpath and she remembered how she was fascinated by the monsters. What makes them move so fast? Where are they going? She was incredibly curious but her mentor said, "Remember Smokepaw, don't go onto the Thunderpath if there are monsters coming." She'd nodded absent-mindedly. Suddenly the noise from all the cars became loud screeching. The monsters were spinning out of control, worse than when a kit chases their tail. She yelled to move and that's what she did. But not her mentor, he was frozen to the spot in, shock or fear, she'll never know. The monster hit him. She ran to his body and panicked. She ran faster than ever to the camp and told them. She had stayed at his vigil for hours on end. She had been hoping for a new mentor soon. All the warriors had been busy and she wasn't completely sure what Whitestar was doing now. All she wanted was a mentor to get her through her warrior training. Stingpaw had just come back from the hunting patrol and dropped a scrawny mouse in the fresh kill pile. The harsh Leaf-Bare had passed but there were still few rabbits on the moors to catch. There were but only a few boney mice and voles around. The warriors here said the rabbits would come soon and that they would be full for once. Stingpaw had never been full in his life. He wondered why he still didn't have a mentor. There were few warriors around. The elders told of how the clans used to be in a forest very far away, but had moved when there was a prophecy and the forest was torn apart. The elders said that the cats then went to a lake that was a perfect place to live. The older elders recalled from their kit-hood when the lake became prey-bare and there was another prophecy. The Clans formed together as one because there were few cats left in each Clan. Now they were here. They went back to their own Clans. But the Clans were still small even though it has been many, many moons since this happened. Then there was Smokepaw. Her mentor had died, meaning even fewer warriors. Maybe that was why he was an apprentice without a mentor? He was mostly just tossed around in a current of mentors. No one wanted to mentor a cruel rouge's kit. One day he was with one cat; the next was another. He knew they didn't like him much. "Hey you, it's your turn with Stingpaw today," the deputy would say. "But I had him two days ago! No fair," the other cats would reply. Stingpaw heard them. Maybe they thought he couldn't. He was a strangely silent apprentice. Maybe they thought he was deaf. He didn't know, and if he cared he wouldn't let them know. He padded out of camp and onto the moorlands. Not that the camp itself was covered. It was just a fall in the earth inside of the moors. He didn't care. It was better then living under trees where he was trapped, or living on an island where he had to swim, or living under pine trees in a marshy area where he would feel trapped while his paws were wet. He spotted a young she-cat padding in the other direction. He immediately recognized her as Smokepaw. He was the closest to a friend he had in the Clan. The only reason being that they were den mates and had nests close to each others. He hardly ever said anything to her but he felt more comfortable around her then the other cats. She was a bit different, but not as different as him. Stingpaw thought at first she was sniffing the air for prey, but now she looked around a bit distracted. She probably remembered her mentor's death. He noticed since then she had always stayed strictly to the side of the moor opposite the Thunderpath. Maybe she would hunt with him? He raced to catch up with her, his long legs taking him almost as fast as an actual Windclan cat. He caught up but was out of breath. Windclan cat's weren't supposed to run out of breath. He was ashamed. He thought about how if these Clan cats were like his Father they might hurt him. They would rake their claws, unsheathed, down his pelt. He already had scars from his Father. He pushed the thoughts out of his head as he remembered he wasn't supposed to share his own thoughts according to his Father. He might as well not think them at all. "Hi," Stingpaw walked up to Smokepaw with a rigid greeting. It wasn't supposed to seem mean. But it did, "I was wondering -- I mean thinking -- um, um wanting to ask you cordially to -- if you would think -- want to -- let me.... Hunt with you?" Stingpaw stammered. He loved words. Loved their meanings, their sounds, the images they set. But he had a hard time saying them, for fear he would say the wrong thing. For getting in trouble. But mostly of the memories of words. Of his Father. Smokepaw was leaving the camp when she heard heavy panting behind her. She turned around to see the closest thing she had to a friend at camp, Stingpaw. For some reason, every time someone said his name to him, he became even more distant. Perhaps he doesn't like his name? After all, it wasn't a queen that gave him the prefix he'd have for the rest of his life, Smokepaw thought. He was stuttering and repeating words so fast she couldn't full understand him. It was always hard to understand a heaving cat. Then she heard 3 words "Hunt with you?" She froze and immediately studied him. No cat has ever wanted to hunt with her, since she makes it clear she likes to be alone. At. All. Times. But he didn't seem to be joking. She relaxed and nodded, "Sure, I was just going a bit more toward the Moonpool. No one has been hunting there in a while so I thought I'd go there." She answered. He nodded and they both started running. She slowed down a bit, since she didn't want him to wear himself out. He wasn't clan born so he wasn't as fast as the others. Although, his fighting strategies are pretty darn good. To be honest, Smokepaw didn't care if he was fast. This clan needed something different, and he was perfect for the job. Maybe now she wouldn't be so lonely. That is, if she let him in. As Stingpaw ran he felt the wind through his fur. He knew Smokepaw seemed to like being alone but he didn't. It seemed like he did since he didn't talk to others. He liked the sound of voices. Of thoughts being shared. He liked the soft pelts brushing near him. He noticed she slowed down. Probably for him. He nodded his thanks but she probably didn't see because his head was bobbing up and down from running in the first place. He didn't care as long as he showed some kind of thanks. Soon they arrived near the Moonfall. As soon as they got there he smelled rabbit. He thought he saw the white flash of a rabbit tail. He darted after it but tripped on his feet. He got up and shook the dry grass out of his fur. When he saw Smokepaw staring in his direction he licked his chest and tried to act cooly. "I'm okay. I tripped on that..." he started, "Clump of grass," he finished. Any cat could plainly see that he wasn't natural Windclan. He was something very different. OOC: Sorry, mine's short, too. Also sorry that my first one was long. You got offline as I was posting this. Ouch. OOC; Ha-ha, nah I didn't log off. I was just open in multiple tabs and closed one (They were all on New Era) so that must've made my pc think I was offline. OOC: Bad PC. Sorry if I have a few typos. I'm on and iPad that has spell shock and sometimes changes my words or caps. I'll be on my lap top tomorrow. OOC: I have to go soon. Don't be surprised if I randomly get out. You're good at RP. Sorry about the short sentences, it's late here. Smokepaw slowed down when they got to the small clearing and caught the scent of rabbit. Just as soon as she was going to get in a hunting stance, Stingpaw made a run for it. And by it, it means the rabbit that is now so scared his puffy tail is probably puffier than usual. Stingpaw ran awkwardly and almost immediately tripped on air. "I'm okay. I tripped on that..." he started, "Clump of grass," he finished. Smokepaw just stared at him as if he were a badger riding a dog. And the dog was pooping rainbows. Suddenly she burst out laughing. She hadn't laughed ever seen her mentor died, since he was the only one with the ability to make her. That was the clumsiest thing I've seen a cat do. Ever! She thought. She knew he wasn't normal, but really, tripping on air? That's just... unexplainable. She concluded in her head that she wanted Stingpaw as her friend. OOC: Really? Aww I posted a RP on Bloodclan if you haven't already seen it. Oh and thanks! This is my first actual RPing so it's nice to know I'm good at it. Stingpaw saw her laughing. He had never seen her laugh. Never even a slight purr. He could tell he was laughing with him and not at him. He purred a little at himself and stood up straight. "I'm not used to this.... Running thing," he said, excusing himself, "you can catch the next one maybe,"
He stared into Smokepaw's eyes. He had never seen her like this. She was always so stiff and lonely looking. He looked out of the apprentice den manyanight and saw her grey hued fur turn to a brilliant but sad silver. As he sniffed the air and tasted it with his mouth he saw a white flash. This time he decided he would watch Smokepaw as she chased it to figure how to catch it himself. OOC: I just saw Sorrel's original setting plans. The Moonpool has been replaces with the Moonfall, a waterfall that forms a pool. Kind of like the Moonpool replaced the Moonstone and now the Moonfall is replacing the Moonpool. Anyways it's all Moon stuff. After Smokepaw finished laughing, she breathed in the scent of a nearby rabbit. She also noticed that Stingpaw was watching her, probably to see how she would hunt. She smiled to herself and was quite proud that he looked to her for something, even though it was just hunting techniques. She located the rabbit and got into the correct stance. Moving all of her weight to hunches, she decided the angle she would best be able to snap the poor rabbit's neck. She made sure her shadow wasn't anywhere near her prey pounced forward, landing squarely on the rabbit. With one swift bite to the neck, it was now food for the clan. Going near the Moonfalls was a great idea, Smokepaw thought to herself. She turned around and saw Stingpaw looking at her in slight awe. She supposed he'd never seen her hunt before. Haha, he should see the other apprentices. They're way better than me when it comes to hunting, she said to herself. "And that's how it's done, Rookie." She said with a small purr. Stingpaw stared at Smokepaw for a few seconds. He stared at the rabbit. How was she so fast? Her legs were so long, her form skinny, and her senses sharp. He nodded at her not wanting to use words again. Nodding was less punishable then saying something. Calling it a "Great catch" would be stating his personal opinion about the catch. That was against his old rules. He thought about how she had stayed away from the creature until it noticed her. She had kept her scent and even her shadow far away from it. She had shifted her weight and the rabbit was down in a flash. "I have not seen this method of hunting," he stated quietly. "I learned to hunt by locating the prey and immediately pouncing on it. I did not know there was so much to this.... hunting," he finished. Why did his words always come out so awkwardly? His words sounded abnormal, chopped up, stupid compared to his thoughts. He gazed at the waterfall nearby that formed a pool underneath it. He wondered why Smokepaw had called it the Moonfall. It didn't look like a moon to him. He saw it coming out of some rocks. Perhaps there was a cave there. He looked at the sky and saw that by now it was a bit past Sunhigh. He'd never heard of the details of hunting? Smoke paw thought, And his words seemed to be foreign in his mouth, perhaps he learned to talk later than most? Smokepaw saw Stingpaw looking toward the Moonfalls, in slight wonder. She thought for a little bit before asking him a question that was on her mind. Of course he's heard of them and what the Moonfalls are used for, right? Smokepaw had never met a cat as clueless as Stingpaw, but then again there aren't many new cats that she knew personally. "Umm... Stingpaw? Have you heard of Starclan?" "Starclan?" He questioned. "I have not heard much of this Starclan. The elders have spoke of it sometimes. I know not of this Starclan,"
The clan elders had talked about a Starclan. But Stingpaw had thought their were only four real clans; Windclan, Thunderclan, Riverclan, and Shadowclan. 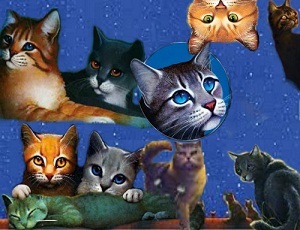 Who were the Starclan cats? "Who is in Starclan? Where do they live?" He asked feeling very clueless. Smokepaw was a bit baffled by the fact he didn't know about Starclan. Then again, he'd never been to a gathering, and there aren't any recent prophecies. The last one was to move from the old Lake to here. She thought for a moment on how to explain Starclan. "Starclan is--. They--," How was she suppose to explain such a thing? Suddenly she knew exactly what to say, as if Starclan wanted her to say it to Stingpaw. "Starclan is pretty much all the cats from all the 4 clans that have died. Whether they died a moon ago or 500 moons ago, that's where they'll end up. It's kind of like Twoleg Heaven, if you've ever heard of that." She started. "Starclan lives among the stars- therefore the name Starclan. If you look up during the night, you'll see hundreds of stars. All of them, are old warriors or leaders. Starclan help us in a time of need, but they mostly talk to leaders, medicine cats, med. cat apprentices, or future leaders. I heard an ancient story about a kittypet becoming a warrior of Thunderclan and becoming leader. His prophecy was Fire alone can save the clan, and that's exactly what he did." Smokepaw concluded, drawing in a large breathe after talking so much. It was the most she'd spoken in a group ever since--- ever! OOC: You're pretty good at RP too! You have a lot more details than me and are a bit more formal, so I think you're kind of better then me lol. Stingpaw's eyes widened. Starclan? Dead cats who helped living cats? "Starclan sounds like a good place. When I was little and my Mother got caught in a fox trap," he paused cringing at the memory, "I asked my Father where she went.... He said she was just gone. I have not heard this idea of cats going places after death," he paused again this time longer, "is my mother in Starclan?" He finished. Smokepaw seemed to just realize the hardships Stingpaw went through. His mother dying from a Fox Trap? That must've been absolutely horrible. But to answer his question was hard. It was usually only warriors from the clans that went to Starclan. Or the Dark Forest... She thought in the back of her mind. "I'm not really sure, but the way you described her when you were a kit, she seems like the type of cat wanted in Starclan." She said with a small smile. She didn't want to eat him with horrible words, so she comforted him with ones that might not be true. "I suppose you'd have to find that out for yourself, and I'm not quite sure Windclan can take an apprentice leaving us right now," Smokepaw concluded. She looked up and saw it was well past Sunhigh now so she said, "It's getting quite late now. We should keep hunting and go back to camp." In all the 2 cats caught 3 rabbits and 4 scrawny voles. Quite good, for right after Leaf-Bare. "Are you ready to go back?" Smokepaw said with 2 rabbits and a vole in her mouth so it sounded more like "Awe lou wetty wo gwo ack?" Stingpaw guess what Smokepaw was trying to articulate And answered with a simple, "Yes." The cats started heading back to camp and Stingpaw began to think about Smokepaw's words. His mother wasn't in Starclan, was she? Maybe there was a place where rouges went when they passed? As they approached the camp the sun sunk lower into the sky. It was almost nightfall and Stingpaw didn't like to be out at night. The stars reminded him of Twoleg Monsters. Now he guessed they would make him imagine cats dying. He started to slow down but Smokepaw kept up a fast pace. He had to put on a burst of speed to catch up. He couldn't wait until they got to the camp. His warm nest awaited him. Of course in the morning he'd have to deal with Smokepaw and her willingness to not wake up. Maybe they would hunt again tomorrow. Ooc: I'm doing a few hour skip after they've eaten and Stingpaw went to the den (or you can make him do something else) and Smokepaw is watching the stars. Smokepaw was stargazing and became utterly fascinated as names of old cats came to her. Oakheart, Redtail, Greystripe, Silverstream, Mistystar, Bluesar, Spottedleaf, Tallstar, Brokentail, and Rusty. This always happened with her when she looked at the stars. Names, scenes, or sounds would fill her brain but she would ignore them. She didn't have a lot of respect for Starclan since she saw her mentor die. Putting the random thoughts aside, she let her mind wander. She thought about if she was where Leerheart was and was killed instead of him, she thought about whether or not she should leave the clan since she didn't really feel welcome, and mostly, she thought about why a kittypet name would come with he other ones. NO. I am NOT thinking about that. It has something to do with Starclan! she ranted in her mind. She decided to think about something else she didn't like, but not as much as Starclan. Mates. Would she ever fall in love? All of a sudden something came to her, not from Starclan, but from herself. The Tribe of- the thought almost completely got to her when she heard a rusting in the tall grass that lined the apprentice's den. She turned around quickly, ready to fight an intruder. Stingpaw was stalking through the grass toward Smokepaw. As he got closer she turned to face him. "Hello, Smokepaw. Are you alright?" He asked. The she-cat had been staring at the stars when she suddenly looked down and her pupils went large. Stingpaw finished walking up to her and saw her eyes went relaxed when she recognized him. Smokepaw calmed down when she saw it was just Stingpaw. "Yes, I'm quite alright," She answered shakily. The last message had sort of scared her a bit. Was it trying to warn her of something important? "What are you doing up this late? I thought you hadn't like stargazing." Smokepaw asked the young Tom. "I could not sleep. This wind in this open, it is too.... strong. It is loud," he answered. He wasn't used to the strong winds here. the camp was literally in the middle of nowhere. The dens weren't even covered. Just some boulders surrounding some grass and dirt. There were some dens dug underground for the kits and elders but most of them liked the open, too. "Are those really dead cats up there?" he asked. "I had thought before our meeting yesterday that they were some of the lights of the Twolegs. They made me think of the shiny things you call Monsters," Stingpaw paused, "Now they shall make me think of dieing cats. Of death, and of my mother," he finished in a mumble. Although she thought that Stingpaw hadn't wanted her to, she heard his last few mumbles. She sighed, calming down completely. She didn't exactly like sleeping in the wind either, but she loved to just sit it in it and think. The feeling of wind going through her fur made her feel invincible. She looked at her new friend, "You shouldn't think of Starclan in that way," She started out calmly. "Starclan represents life after death, another chance I suppose. Once you join it, you become wise and intelligent. I bet you right now your mother is looking down on you, full of pride. Not many rouges or loners can say that their only son is a warrior of the forest. Starclan is full of only good and true at heart cats, so there is no need to fear or resent them. If anything, you should be anxious to meet a Starclan warrior. If I go to Starclan one day, I plan on meeting all of the 4 major cats. Thunderstar, Shadowstar, Riverstar, and most importantly, Windstar."